Hello friends finally after finishing my CA final exams I am again here to serve you some interesting things regarding our field. As all of us know that we have just went through from a Political month and voted recently in elections 2013 but the biggest question arises in our mind that How Political Party funded? How they arrange such a long Rallies & Functions? How they are financed? Few days before one of the political party AAP raises the same issue by declaring all of its sources of donations, but still there is lacuna in transparency of donations received by other political parties. Let’s come to the point in this blog I am raising curtains from this issue & putting in front of you all the background activities behind these donations. The public has no idea about where three-fourths of the funding of political parties comes from. Political parties rely heavily on donations for fighting elections and running their daily affairs. They receive huge sums of money in the form of donations and contributions from corporate, trusts and individuals. Section 29C of the Representation of People Act, 1951 says that political parties are required to submit contribution details received in excess of Rs 20,000 from any person or a company. Section 293A of Company’s Act, 1956 states that no Government company and no other company which has been in existence for less than 3 years, shall contribute any amount to any political party or for any political purpose to any person. They can only donate up to 5% of its profit in a year, and the company is bound to disclose the amount in its profit and loss account. This exercise should be conducted with the approval of its board of directors through a resolution. political parties cannot receive contributions from government companies. Any contribution made by an individual/Company to a political party is fully deductible under section 80GGC/80GGB of the Income Tax Act 1961. As per section 13A of the I.T Act, any income of a political party which is chargeable under the head "Income from house property" or "Income from other sources" or “any income by way of voluntary contributions” received by a political party from any person shall not be included in the total income of such political party if they: (a) keeps and maintains such books of account and other documents (b) in respect of each such voluntary contribution in excess of twenty thousand rupees, such political party keeps and maintains a record of such contribution and the name and address of the person who has made such contribution. Under Sections 3 & 4 of Foreign Contributions (Regulation) Act (FCRA), 1976, political parties are not permitted to accept contributions from foreign companies or companies controlled in India by foreign companies. How Black money is routed through Electoral Trust? Donating money to political parties first started in Germany. In India, it was first adopted by the Tatas, who floated their electoral trust in 1996. It was followed up by the Birla’s a few years later. Since then money from these companies have been routed through this trust, as they felt this was a good way to participate in the electoral process. The Budget 2009-10 proposed to provide 100% tax exemption to electoral trusts. The only caveat is that the trust uses or distributes at least 95% of its income from such sources for the objective it was set up for. It is yet another stimulus for making white out of black money in an economy of forgone taxes. And friends, it is an American system directly imported. US economy turned corporate imperialist as corporates fund US political system. All money is white there, black. Money made from prostitution, drug network, mafia activities are also pumped into the democracy. Another issue is that of allowing anonymous donations. The current limit of Rs 20,000 on anonymous cash transactions is routinely bypassed by the donation of multiple smaller sums. The channels of real estate companies, education and religious trusts, which deal with large-scale cash transactions, are known to be used to route anonymous donations. Now I am coming to main point that how political parties funded. Very first benefit given to Political parties is by introducing Section 13A since 1978. As per provisions of this section income of Registered political party is exempted except Income from Business/Profession subject to few conditions like maintaining proper accounts, accounts should be duly audited, for voluntary contribution above Rs.20000 records of name and address of contributor should be maintained. This is the short summary of provision by Fig. 1.1. Problem faced by Political Parties in section 13A: In above section there is good relief to political party, but still they are missing something more than they actually get i.e. many corporate tax payers are feared to donate money to political party because of there name disclosure in public due to c) condition in section 13A. Due to above section political parties are obliged to disclose name of all donators who are contributing amount exceeding Rs.20000 which they really don’t want to disclose because many of the corporates route there black money in cash to political parties. Solution made by Government for them: For solving this problem of political party government introduced new section-13B vide Finance Act 2010 which introduces concept of Electoral Trust. As per provisions of this section Any Voluntary contribution received by Approved electoral trust is exempt if it distributes 95% of the aggregate donation received during the year along with any surplus brought forward from earlier previous year. It means now electoral trust is not require to maintain any records like name & address of person contributing so corporates doner who are giving there black money as a donation also gets relief & political party is also get funded by the 95% amount distributed by the Electoral trust. 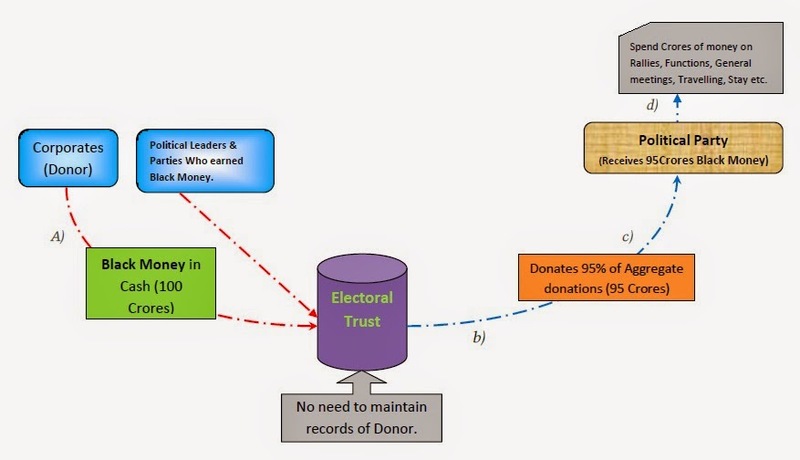 Lets summaries the Scenario by the given below diagram how Black money introduces silently as donation without disclosing name of donor. The total funds received by six national political parties between 2004-2005 and 2011-2012 was Rs 4,895.96 crore of which only 8.9% was from known donors. Around Rs 3,674.50 crore or 75.5% were anonymous contributions. Congress tops the parties for the largest amount (Rs 1,951.07 crore or 82.5%) in anonymous donations & BJP 73%, BSP 61.8%. 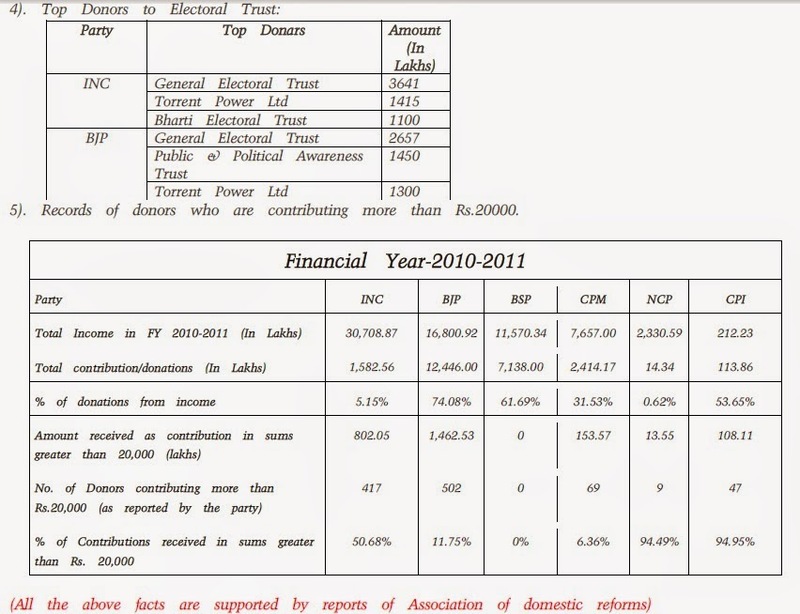 Congress accepted 90.38% of its total funds between 2008 and 2012 in cash and only 9.62% were in cheque. Over 67% of BJP's total funds were in cash while 83% of NCP's were in cash. Due to these cash donations it becomes all the more difficult to establish the identity of the donor. a).Jindal Steel and Power Ltd (JSPL), which has been allocated as many as 12 coal blocks, donated Rs.1.05 crore to the Congress. b).Sterlite Energy Ltd, which was given a coal block in Orissa in 2008, donated Rs.1 crore to the Congress in 2004-05 and Rs.5 crore in 2009-10.
c).Firms associated with the Adani Group are said to have donated Rs.2.5 crore to the Congress and Rs.2.75 crore to the BJP between 2004-05 and 2009-10.
d).Tata Sons, whose entities like Tata Steel, Tata Power and Tata Sponge Iron have been allocated four coal blocks also made handsome donations through the Electoral Trust which it established in 1996. Hindalco Industries is one of the biggest donors to political parties through its general electoral trust. The other major donor to political parties is the electoral trust established by the Tatas, which has donated Rs 9.79 crore. The Congress was given Rs 5.64 crore while the BJP got Rs 4.14 crore. The CAG on the coal scam had named Tata Power as one of the beneficiaries in the coal scam. e).According to the National Election Watch and the Association for Democratic Reforms, the other trusts and companies which have made contributions to the political parties include the Bharti Electoral Trust, ITC Limited, Asianet TV Holding Pvt. Ltd., Ambuja Cement Ltd., Harmony Electoral Trust, Mahindra and Mahindra and Larsen and Toubro Ltd. Most of the parties are financed by Electoral Trust. Our democratic country has recently passed RTI to bring little transparency to trace beauroucracy but we are in need to take some steps for this. Let’s see winning party will do anything regarding it or not. Only five regional parties have regularly filed their contribution reports from 2004-05 to 2010-11 to the EC. Eighteen regional parties have never submitted their contribution reports. Disallowing anonymous donations or taxing them is an idea that should be seriously considered. It becomes all the more important to have a strict regulatory mechanism wherein political parties have to report the correct quantum and the source of donations received.